Meet at your hotel at 8: 00 a.m, choose your bike and driver and GO !! Go along Thu Bon river, up stream to mountainous area, stops on your way. Visit My Son( skip if you have), walk in the valley to understand one of some thousands of year civilizations in the world. Have the best local noodles there with green tea. Continue up the river, along the mountains, through local villages where you can see more trees and trees, a sign of highland. Arrive at Kham Duc town at 5 p.m and check in your mini hotel. Dinner and then overnight in hotel. Day2: Kham Duc- Kon Tum. Check out hotel, have breakfast next to the hotel and get ready. Drive on the Real highland road. Good road but not many bus or cars. This is Ho Chi Minh Trails in the past. Phoenix Airport : former military airport used in the war. Some of horrible images of the war will return just enough for you to understand our history. Then we will stop at the hot spring Dak Ha to see the water fall, a great way to relax right here at the middle of highland. See Trieng Minority Village will be the next stop. Here you can see the ethnic goup that we call “brother” in our country. Try once in your life to cross the “monkey” bridge here. Lunch with local people where they have to work away from home is another good way to enjoy your day. 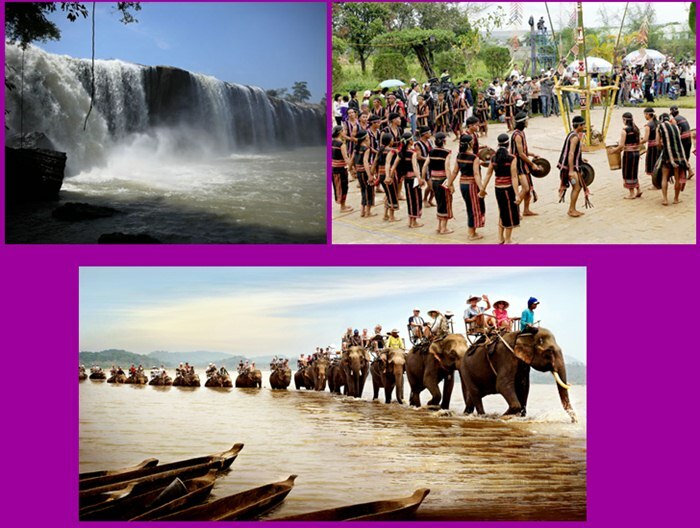 In the afternoon, we will drive to see the meeting point of 3 countries: Viet Nam, Laos and Cambodia. Then we will go by some relic from the war like: Charlie Hill and Dak To battle field. Many opportunities for your camera are on your way. We arrive at Kon Tum late in the afternoon and check in hotel. Dinner and overnight in Kontum. Have breakfast in hotel, check out and be ready for another excellent day. Take a quick look at Ktu ethnic village near the town and wooden French church which was original built in 1930 by French. Enjoy the fun with children in village and the original architecture. Have some drinks and Go. Drive along mountains with fresh air is always great. With less traffic, best scenery, friendly companion. Everything is so good! On our way, we will go by a lot of families where make rice noodles. We can stop, take photos and try to be a professional maker. Hay! It takes time! Then sometimes we go by some nice farms where there are many plants with nice shape leaves but you may not know what it is. It rescured many of Vietnamese in the WW2 when we did not have enough food: it’s Cassava ! Have great local food af a local café by the main street. History will continue when we go by some of huge rubber plantations where supply main source for our industry. However, it also remind us about our bitter time when boys and men had to leave home to grow them in 18th and 19th centuries. Then we will go by some of our top products that bring more than 1 million U.S Dollars a year: those are cashew and black pepper. Huge gardens of many concrete columns and trees will be great stops for us. Day4: Ban Me Thuot- Lak Lake. Today is a great day for the best water falls. It’s time for you to swim in extremely fresh mountain water. It’s one of our most beautiful natural water falls. They are Dray Sap and Dray Nu. Jump into the Fairy pool and give yourself the best treatment. Then continue to Lak Lake, the natural lake in Central Highland. The lake seems a gift from the God to the highland people to make their life sweet with water for the field and farms, fishes in the lake and one of the best places to relax. Check in your hotel. You can choose to stay in M’nong people common house: traditional Rong house or a lake side modern bungalow to enjoy the view. Evening activities will happen after your dinner. Drums, gongs will be beaten with songs and fire. Happy hour is for your now. Have breakfast in hotel and check out. Get on bike and start on the beautiful road up to Dalat, the city of flower. Drive by some ethnic minority villages with panoramic views. Stop at some chopstick factory for you to understand our food culture. Then up to Agent Orange mountain where you can listen and see more about the horrible result of the war. Lunch will be ready at another local café with local food. Continue heading up to Linh An pagoda with a huge statue. Buddhism still remains strongly in our modern life. We may stop at some silk factories to see the process to make raw silk and a stop for you to buy some nice souvenir home. Along the road now there are more and more pine trees. From the near hills to far mountains. From small trees to big ones. Beautiful! When we see some small houses built on the tops of some hills it means we arrive! Welcome to our “Little Paris”: a city of pretty hills, of four season weather, of nice lakes, of colourful fruit farms and all year round flower. Check in your booked hotel and we finish a 5 day dream drive. Another dream is waiting for you to discover here and further! Price: 85 USD/ person/ day. Children: under 5: not accepted( car tour is suggested), from 6 to12: half price. Older than 12: full price. 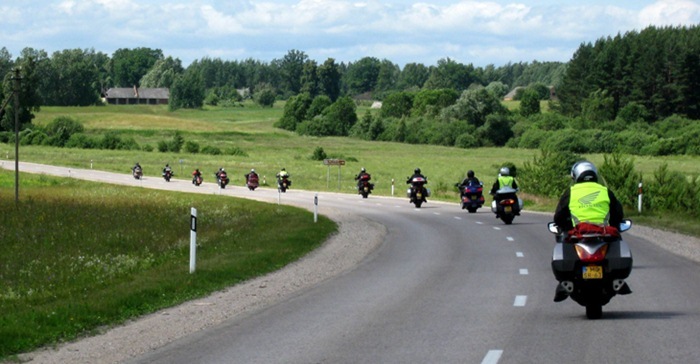 Tour includes: new bike with fuel, pro helmet, English tour guide, friendly driver( if needed), drinks on tour days, local food, family hotel or homestay accommodation, travel insurance.